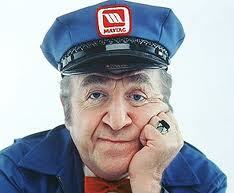 The battle between me and my cursed (a term of endearment) Maytag dryer continues to rage. It stopped turning on Thursday of last week and I decided to beat it into submission as a weekend project. I had a new belt at-the-ready and was set to resuscitate it back from death one more time. I knew the belt that was on it was cracked and worn based on how it looked when I last had the thing in pieces to fix the heating element. So I crack the thing open on Saturday morning looking to get it running in 90 minutes or less. It takes a total of 12 screws to get the drum off and release the belt. After taking a picture of the pulleys to make sure I restring the thing correctly I release the idler pulley which allowed me to get the belt off. I put the new belt on restring the thing and put the whole mess back together. I plug it in for the moment of truth. I turn it on and...drum roll...lots of buzzing, but no tumbling. 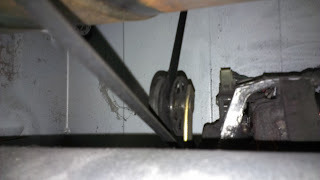 Disassemble the whole unit again and realize that the idler pulley wheel is not moving. I give it a squirt of Liquid Wrench and it starts to spin freely again. I'm thinking Now that must be what's causing the issue. I screw the whole thing back together, turn it on again and...drum roll...it tumbles. In fact it tumbles for almost a whole load before it stops again. After further futzing, tweaking, turning and a few colorful metaphors, I conclude that the idler arm must be the problem. It's also a $30 assembly and above my area of expertise. Actually the whole project kind of is, but I was able to eke a couple of extra years out of the stupid thing. As a Maytage EMT, I've done all that I can do. It appears that it is no longer on life support, but has passed on to appliance heaven, or given its history on earth, appliance hell. And so I think we're very soon going to be in the market for a new dryer. Luckily it is summer and we can use clotheslines for the short term. Later that day, I notice there's a nail in the tire of our Santa Fe. Oy. What the heck? There's some bad karma flying around these parts lately. Why do these things always happen in waves? The good news is the tire seems to be holding air okay. The bad news is, well, isn't a nail in the tire bad enough? I know we'll fix the tire and eventually buy a dryer, but if anyone out there knows a reputable tire place and a Maytag repairman looking for a side job, well, lets talk.